If you have a huge PDF file and love the images in it and would like to use them elsewhere then saving them would be a difficult task. Taking snapshots of each of them is really painful. Hmmm, so what’s the easy way? 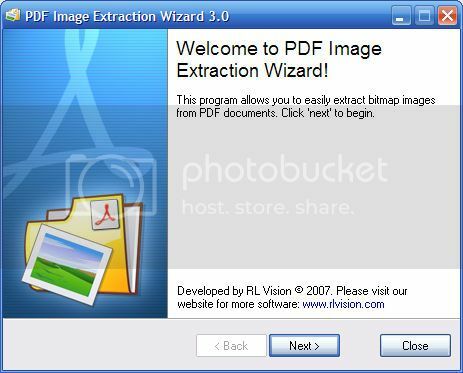 I came across a program known as PDF Image Extraction Wizard which can be used to extract images from PDF files, this application is quite easy to use, and works perfectly. It’s hardly 1MB in size and is quite light on system resources too. To extract images all you need to do is first install the program then simply enter the path of PDF file, output folder for images, and filename format. Unfortunately, this program isn’t free! The unregistered version allows you to extract only first three images from the PDF file. Registration will cost you about $10.